Administrator Gina McCarthy of the EPA delivering the opening keynote at SIA 2016. Two weeks ago, Administrator Gina McCarthy of the U.S. Environmental Protection Agency delivered the opening keynote at the Snowsports Industries of America trade show in Denver, Colorado. McCarthy was hosted by SIA and Protect Our Winters (POW), an organization dedicated to mobilizing the snowsports community to lead the effort against climate change. Administrator McCarthy’s comments to top business leaders and athletes of the snowsports industry represented an evolution to a more mature and intelligent climate conversation. At SIA McCarthy had a sympathetic audience, as she acknowledged in her speech: “Snowsports consumers care about the climate more than anyone.” She sought to empower industry leaders to collaborate, and to create positive momentum for the movement. Her remarks touched on a few core themes. First, she called on snowsports leaders to highlight enterprises working in ways that are good for both business and the environment. She specifically asked the industry to shine a spotlight on manufacturers producing climate-conscious products. “What can we do together?” she asked the audience, which included high profile athletes and business leaders such as Jeremy Jones (the Founder and President of POW), Brody Leven and Donna Carpenter, President of Burton Snowboards. Second, McCarthy asked for support in making climate change a moral and economic issue instead of a political one. She lamented repeatedly: “Why is climate a partisan issue?” and drew a fitting parallel: it is not contentious to talk about cigarettes as a cause of cancer. She called upon industry leaders present to normalize the conversation. Her goal is to move environmental concern from a controversial political conversation into one that acknowledges its moral, social and economic realities. McCarthy chats with POW Board Chairman and Aspen Ski Company VP of Sustainability Auden Schendler about climate change and the snowsports industry. Third – and most encouragingly – McCarthy’s language and attitudes showed that she has moved past the knee jerk reaction all-too-common to the environmentalist’s approach that “COAL IS BAD! BUSINESS IS BAD! CORPORATIONS ARE EVIL!” This is a strategic shift in rhetoric, one critical to creating a general culture that seeks solutions collaboratively. She stated the importance of “retooling and retraining” the laborers of the fossil fuels industry and spoke of creating “market incentives” to align environmental and business interests- a refreshingly pragmatic change in language. The EPA’s strategy of recruiting industry leaders and figureheads is well-conceived and impactful: the industry (along with all the associated commerce) generates an estimated $67 billion in annual revenues and employs around 900,000 people – people already keenly aware of the environment and humans’ impacts on it. Beyond this, the pro skiers and snowboarders working with POW and the EPA have a strong influence in younger populations on the verge of becoming highly relevant to the political conversation. 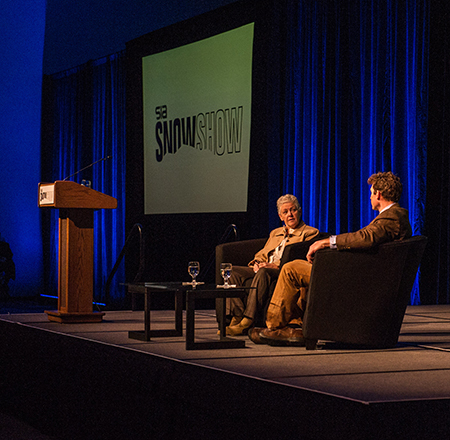 After her opening remarks McCarthy sat down for a more informal conversation with Auden Schendler, Chairman of POW’s Board of Directors and Vice President of Sustainability at Aspen Ski Company. The two dove more deeply into exactly how to frame the climate conversation in society. “This is not an environmental issue – it is an issue with an environmental impact. It is an economic, social, health, and moral issue.” McCarthy suggested that this argument be used to encourage developing countries such as India and Indonesia that are hesitant to adopt a strong policy stance in reaction to climate change. Legendary big mountain snowboarder and Founder and President of Protect Our Winters Jeremy Jones takes in an important conversation. Unfortunately, for all the enlightened rhetoric and her collaborative approach, many of Administrator McCarthy’s efforts are dead on arrival – an Obama appointee, much of the country writes her off before she even opens her mouth. This combined with a few recent environmental gaffes – Flint, MI and the Gold King disaster near Silverton, to name two – and McCarthy’s critics allow themselves to justify their ignorance of the greater issue. For this McCarthy’s recruitment of snowsports leaders is even more important: more people broaching the subject in different ways may create the space for climate deniers to relax their skepticism and consider that in many ways environmental action is aligned with their personal values. For example, McCarthy made the clever insight that installing rooftop solar panels should resonate with libertarians – many conservative Americans want to chart their own destinies and control their own lives, to live in a self sufficient manner. The trick, as McCarthy pointed out, is to make it so people aren’t painted as “tree huggers” for merely bringing the topic up. In many ways the snowsports industry and the environmental movement have grown up alongside each other. In adulthood, key players in both camps are no longer punk rocker youth or tree hugging communists; they are global citizens, sophisticated and educated businesspeople and community leaders who understand the necessity to work within a system to create a real impact. Moving towards the third decade of the 21st century, together they are starting to do the real work needed to change the culture around the climate conversation.